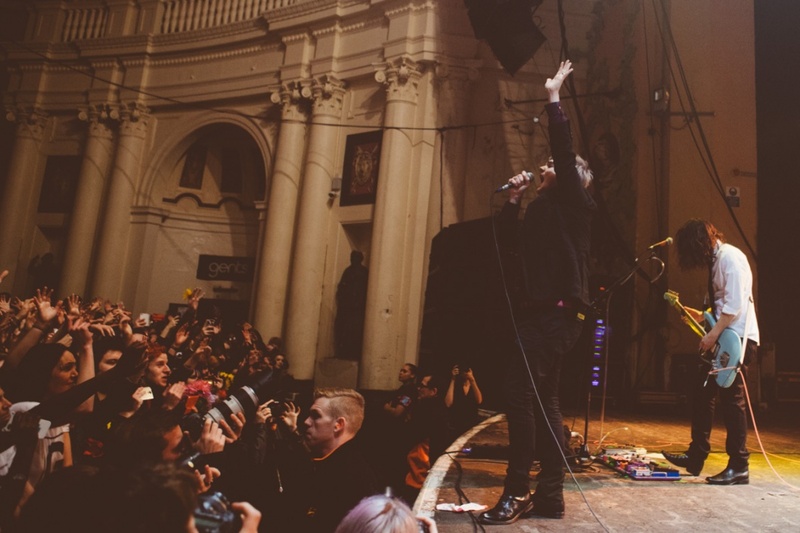 Over the course of the last week I’ve seen Gerard Way perform two live concerts in the UK, in which he has gone out of his way to make a series of speeches that have firmly convinced me he may be one of the most important people in music today. For those not in the loop, Gerard Way is probably best known for spending a decade as the lead singer of the band My Chemical Romance before they disbanded in early 2013. A New Jersey rock band, My Chemical Romance had a huge career that is considerably larger than the small period of controversy most know them for. Over four albums MCR took their audience on a decade long, incredibly healthy journey through dealing with depression. Their albums covered anger and denial, moving to sadness and acknowledgement, continuing to defiant insistence that “I am not afraid to keep on living” and ending at an energetic celebration of life. I spent the better part of my teenage years infatuated with My Chemical Romance. As a child who battled with feelings of dysphoria and depression all throughout puberty, their brand of music really felt like a constant source of support for me growing up. Weirdly, it’s not actually Gerard Way’s first solo album Hesitant Alien that convinced me to write this article, but his actions outside of the studio that caught my attention. Back in October 2014 Gerard Way took part in a Reddit AMA (Ask Me Anything) where among all the other questions he was asked, he spoke to a transgender fan about his feelings on gender presentation. The fan, who attributed much of their willingness to explore their gender presentation to Way’s feminine presentation on stage during My Chemical Romance, asked what style icons Way took inspiration from during that era when it came to his musical persona. Way responded incredibly respectfully to the fan, expressing empathy with those who have struggled with gender in their lives and briefly touching on his own struggles with gender identity, granted not on the same scale as someone who identifies as transgender. “Wow! I’m so glad that helped in figuring out your gender identity. I have always been extremely sensitive to those that have gender identity issues as I feel like I have gone through it as well, if even on a smaller scale. I have always identified a fair amount with the female gender, and began at a certain point in MCR to express this through my look and performance style. So it’s no surprise that all of my inspirations and style influences were pushing gender boundaries. Freddy Mercury, Bowie, Iggy, early glam, T-Rex. Masculinity to me has always made me feel like it wasn’t right for me. For a lot of transgender fans, myself included, this was the beginning of a real love of the man behind the music. It’s incredibly rare in any form of mainstream media to see gender fluidity openly acknowledged, or any level of support and acknowledgement for trans individuals. It was heart warming to see and amazingly was only the start of an increasingly bold series of actions on Way’s part. This prompted a lot of questions to Way on Twitter, which he responded to with remarkable patience. He discussed his regret over the character “ladyboy” who appears in the Danger Days music videos and shares their name with an anti trans slur, as well as talking about his reasons for deliberately misgendering a trans character during the song Get The Gang Together on his Hesitant Alien album. He interacted with trans fans, he offered support and he willingly went away to learn much more about a group of people he had never really taken the time to understand growing up. Reading through a series of his tweets with trans fans prompted me to dig back a little through the opening weeks of his solo career, where I discovered that as early as his first promo show at Warner Bros, he had been referring to his backing band as The Hormones. Was this a direct move of support toward trans fans, I honestly have no idea. Still, with the context of his later trans support, I will probably forever associate the idea of Gerard Way and The Hormones as a move of support for trans fans. A couple of weeks ago, in early January 2015, I started to get excited about seeing Gerard Way play in the UK and began to watch clips of some of his live performances from the previous few months. Three or four videos in I stumbled across a video from one of his earlier shows where he was up on stage giving a speech in support of his trans fans. As touching as it was by itself, it became even more touching when I realised the reality of the situation. Gerard Way was stopping during every single one of his shows to give a short speech in support of trans and non binary individuals. Ever since his North American tour began, following the short run of promo shows at WB and in the UK, he had been repeatedly taking time to support trans fans during his shows. Just let that sink in for a moment. Gerard Way is a hugely successful solo artist, selling out venues, taking time out of every show to show support to fans struggling with gender identity issues. That’s unbelievable. As someone who really struggled throughout their teenage years with depression caused by gender dysphoria, My Chemical Romance were a constant source of strength and inspiration. As a woman in her twenties who is finally getting her life where she wants it to be, knowing the man whose music kept me going for a decade cares this much about supporting a group usually only regarded as a joke by media is unbelievably important to me. I seriously could not wait to see him perform. So I camped out twenty two hours early for Way’s Southampton tour date. Many people, my mother in particular, told me I was crazy for doing so. I don’t think she understood wanting to see anyone perform so much they would turn up that early. Truth be told, Gerard Way is the only artist I would have done that for, just because his recent trans support pushed me from a fan of his work to someone I sincerely wanted to personally thank for what he has done. I got centre barrier for the Southampton show, he gave his trans support speech, and I just cried. The entire room erupted into applause in support of his words. For the first time in my life I was in a room packed with people where I felt like everyone supported me. The feeling was incredible. One man offering trans support transformed a room of thousands into somewhere that felt unanimously safe. I unfortunately missed my opportunity to meet Way that night and give him my personal thanks for what he had done to support trans fans of his work. He said on stage and on Twitter he would not be signing or meeting fans that night. Ten minutes after I left to catch my train, he came out of his bus and met a group of fans. I headed up to Brixton in London a couple of days later for his final UK tour date. Arriving at 6am, I was around 20th in line for the show, which got me a spot on the barrier, but over to one side away from the centre. I had little hope in seeing him after the show to thank him, as he had to be in Amsterdam the following night and would likely have to leave the venue fairly quickly. I decided to use my time in line before the show to make a simple A2 sign to try and get my message to him. Taping several pieces of card together I wrote as large as I could a short message thanking him for everything he had done for his trans fans. It wasn’t much, but I just wanted to let this man know how much his support meant to me. Right on cue, about a third of the way into his show he did a speech in support of his trans fans once again. I held up my sign and my friends on the barrier all did their best to draw his attention to my message. It was unclear if he had read it, but I felt I had done all I could. Then, the thing that kind of blew me away happened. Once per show during this solo tour Gerard had been pulling a fan up from the crowd to play tambourine with him on stage during one of his songs. He walked over, pointed at me and told me he wanted me up on stage with him. I don’t know how much was to do with recognising me from the previous show and how much was to do with the sign I had made, but I would like to believe he saw my message of thanks for all he has done and appreciated it. I hope so, because I appreciate the hell out of everything he has done for his trans fans. Getting to join him on stage was a once in a lifetime opportunity, but getting to thank a man whose music has been a constant source of strength for me was the real reward. Thank you Gerard Way. It may not seem like you’re doing much, but in a world so against trans people, the fact you’re taking time out to support us means the world to me and so many others in my situation. I hope one day I have the chance to chat to you face to face properly, because I owe you a huge thank you. Your experience sounds awesome! I’m glad you could find solidarity with a band you love – the same thing happened with me and Against Me!. The lead singer, Laura Jane Grace, came out as a trans woman a couple of years ago, and their newest album (Transgender Dysphoria Blues) is fantastic. I got into their music, until I finally went to see them in November. I went to both the London and Birmingham gigs, and I gotta say, it’s wonderful to be in a room full of people who you know are going through the same things as you. Everybody is shouting for the same reason.